There is a clear correlation between the maturity of the device ecosystem and the time it takes for the market to deliver on the goals and business objectives. For example, the 3rd generation (3G) buildout, required five years to build a sufficient supply of affordable devices, and the 4th generation (4G) buildout, required just two years. The availability of 5G devices now, enables the market to mature in concert with the underlying infrastructure buildout. Operators can leverage their existing 4G cell sites to deploy 5G services, which radically changes the deployment cost model. Existing sites can be configured to support new more compact RAN gear, avoiding additional site acquisition costs and minimizing regulatory permitting and compliance issues. • Small footprint solutions help reduce site expenses and minimize regulatory issues associated with previously larger site footprints. • Solutions such as Huawei’s SuperBlade supports all mobile generations on a single pole, which lowers deployment costs, minimizes environmental impact and provides operators the flexibility to cost effectively provide 5G as well as legacy services. The expected power consumption of 5G is expected to be the same as 4G; however, 5Gs power consumption per bit is only one-tenth of that consumed by 4G. New silicon deployed in smartphones, base stations, and transport equipment delivers greater performance, while consuming the same or less power than their 4G (LTE) counterparts. • Mainstream silicon suppliers such as Huawei, Intel, MediaTek, Qualcomm, and Samsung have announced chipsets to support 5G, IoT, and other new use cases. • Manufacturers have announced 5G devices which address a range of uses and form factors – accelerating the commercialization of 5G. • At last count, Huawei, LG, OnePus, Samsung, Xiaomi, and others have announced over 40 5G devices, which are or will be commercially available in 2019, with more targeted for 2020 and beyond. • Innovations announced, include foldable models (Huawei Mate X, Samsung Galaxy Fold), improved imaging with multiple camera technologies (Xiaomi/Sony 48-megapixel, Microsoft HoloLens 2, Nokia 9 PureView), high resolution screens (Zperia 1 21:9 aspect ratio), and others. • Operators are beginning the transition from 5G trials to commercial services during 2019. Early deployments are global, and demonstrate the rapidly growing end user appetite to consume new services, and the operator’s desire to become recognized for their technology leadership. • Operators who have announced services include, but are not limited to: LG U+ (Korea), Sunrise (Switzerland), BT/EE (UK), Ooredoo (Qatar), Etisalat (UAE), and Viva (Kuwait). • Operators in China, Japan, and the United States also plan to be significant players within their countries. Each market has its own priorities for 5G which represents the diversity of use cases. 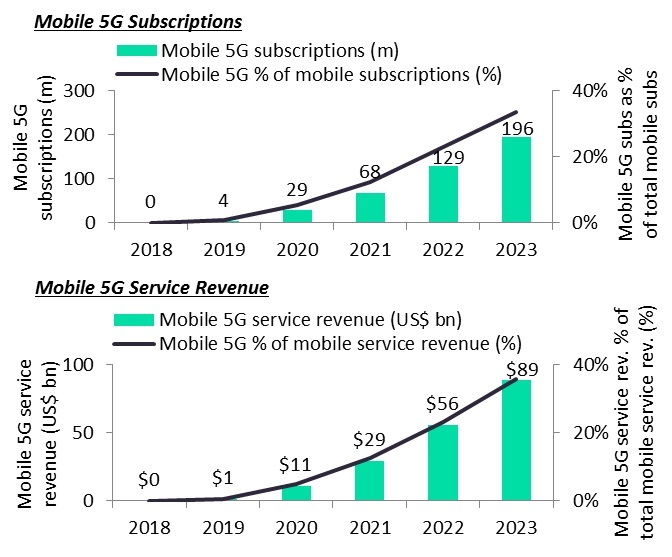 • Governments see 5G as an opportunity to grow their GDP and are helping to accelerate deployments by expanding available spectrum, with new frequency bands as well as re-farming under-utilized bands. • eMBB will not only deliver higher speed broadband services, but can begin to satisfy additional service requirements such as media broadcast, policy-based services and specialized vertical market applications, without instrumenting features such as network slicing. This provides a longer runway for operators to become proficient with 5G and capitalize on new opportunities, while advanced features are tested and operationalized. • Vendors are re-architecting and integrating multiple mobile core generations (2G, 3G, 4G, and 5G) using a common containerized micro-services-based architectures. This presents a common management and deployment model which simplifies operations and provides the agility needed to support new services. • Multi-vendor/operator cooperation has been front and center, with initiatives such as interoperability development testing (IoDT) launched in 2017. China Mobile (CMCC), Intel and Huawei achieved 5G IODT in compliance with the 3GPP Release15 standard. For 5G networks, the ecosystem readiness has never been so well aligned, a first in the history of mobile communications. The timely development of the ecosystem is leading to the rapid development of 5G as noted in the following GlobalData chart. The GlobalData forecast for 5G subscriptions through 2023, is based on capable and manageable 5G network infrastructures being solidly in place by 2020, and the availability of 5G smartphones and devices. 4G expansions are also expected to grow during this period, which adds to operator capacity and coverage challenges. Conclusions: The full potential of 5G is yet to be realized; however, the key tenants needed for success are present. As network infrastructure builds continue through 2019 and 2020, and the 5G device ecosystem thrives, all signs point to the continued and early success of 5G. A strong ecosystem is at the very foundation.